Hey friends....I hope you all are fine. Are you are pissed off with the slow Firefox speed??? 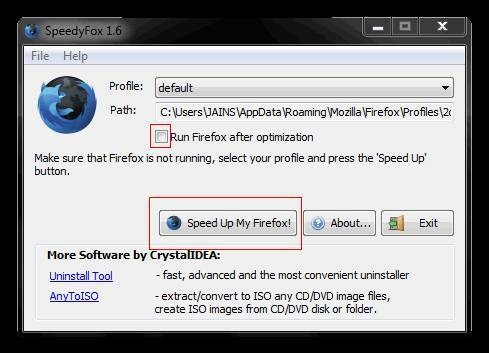 Then Today am going to provide you a very useful tool for you that is SpeedyFox, which will help you to get rid of slow Firefox Speed. SpeedyFox is a small utility which compresses all your saved data and thereby, enhances your Firefox speed to a great way. It compresses all the data that makes Firefox heavier and eats up its speed. It will compress it and will make it faster and smoother. It will boost your startup time by 3 times. After Downloading SpeedyFox, Just run it. When it will be optimized, the Firefox window will open and you will see a Sudden increase in your Browsing Speed!!Enjoy!!!!! !